Welcome to the 2018-2019 cricket season! Welcome back to families from last year; we would like to enlist your help to spread the word and encourage new families and new players to join our great club this year. 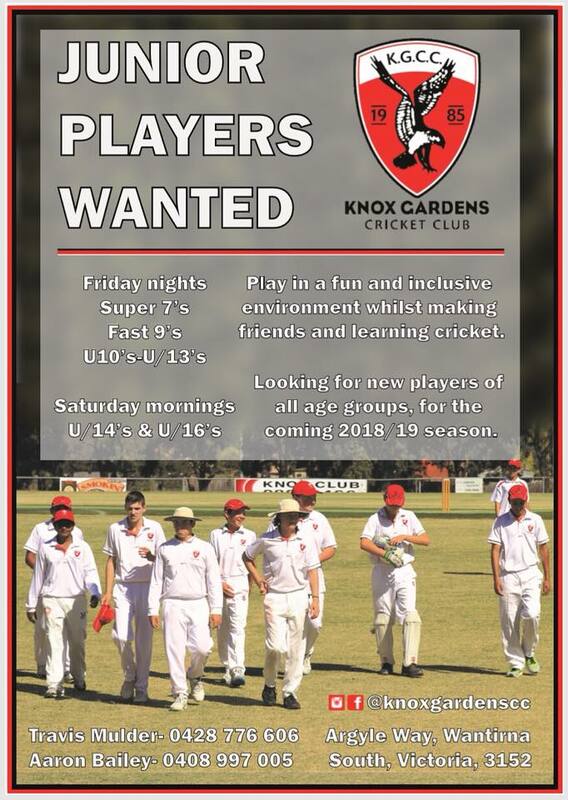 Once again the Knox Gardens Cricket Club is looking to be well represented in all grades and our strong Milo Program has proven to be the ideal pathway for the Falcons stars of the future as they move into the Under 10 soft ball team. In 2018-2019 we will be continuing our highly successful Friday night Milo In2cricket program for boys and girls just starting their cricket careers. We will also have Under 10, 11,12 & 13 teams on Friday nights again. Players participating on Friday nights are also able to register and play competitive Saturday morning cricket. On Saturday mornings the club will be fielding an Under 14 & 16 team. All registrations cover: Match shirt , Association Fees, Team Rego & Insurance, Cost of running club, Training costs incl Nets, Balls/Equipment & Grounds, Coaching, Facilities & Power etc, Match Day costs incl Grounds & Drinks (home games). It is the intention of the club to ensure all coaches are Level 1 coaching accredited and have a Working With Children certificate. NOTE: All subs include a FREE match day playing shirt for new players.